This building is one of the most distinctive remaining elements of Ballard's lumber industry. The Stimson mill was one of Ballard's first large saw mills, established when C. D. Stimson purchased a dilapidated mill on Salmon Bay in 1889, just in time to provide lumber for rebuilding the city after Seattle's Great Fire. The mill grew to be one of the city's largest mills, and helped Ballard achieve the title of "Shingle Capital of the World." This building was used as the office and "pay shack" for the mill, located across the street on the waterfront. the window where workers came to receive their wages remains on the west elevation. The Stimson mill closed in 1958 and the property was converted to an office park and marina. At that time this building was remodeled. The distinctive Dutch stepped gable on the main facade was replaced by a more traditional triangular gable and the windows were partially covered. A canopy over the main entry has been added since. The building continued to be owned by the Stimson Mill Company for many years, and was the office of the Crescent Lumber and Shingle Company, a lumber wholesaler, and as a real estate office for the Stimson Company. It now appears to be a residence. The Stimsons, one of the Northwest's most prominent families, used the fortune from the mill to purchase considerable real estate holdings. They later developed a chain of television and radio stations, and are still a major force in Northwest real estate development, cultural activities, environmental activism and historic preservation. 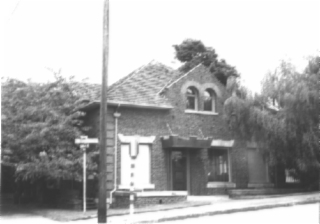 The building was designed by Kirtland K. Cutter, a prominent Spokane architect who had designed Mr. Stimson's house (1898-1900) on First Hill, as well as the Rainier Club (1902-04) and the Seattle Country Club. Cutter, originally from Ohio, trained as an illustrator. However, when he arrived in Spokane in 1886 he began receiving architectural commissions and designed numerous downtown buildings there after an 1889 fire. He was considered the most prominent architect in Eastern Washington, but also did a number of Seattle houses and works in other states. He moved to Southern California in 1924 and continued to practice there until his death in 1939. This hip roof building has clinker brick cladding, a shake roof and quoins of large red bricks. The main façade on the south has a tall gabled parapet with a pair of arched windows with sandstone surrounds. The two first floor windows have been altered, with single large fixed pane wood sash; one is covered. The windows have sandstone sills and couvoirs. The entry, with a newer wood door, is between the windows, sheltered by a crenellated suspended canopy, a relatively recent addition. The west elevation has the original pay window, smaller than the others, with a double set of concrete steps where a line of men could move through and pick up their wages. Other windows there have been covered. The area around the front of the building is enclosed by a low clinker brick wall capped with sandstone; this is probably original. At the rear is small flat-roofed wood-clad addition and wood fire stairs leading to the second floor. In the rear is a garden surrounded by a black wrought iron fence; there is a parking lot on the east side. Kreisman, Lawrence. The Stimson Legacy: Architecture in the Urban West. Seattle: Willows Press, 1992. Passport to Ballard: The Centennial Story. Seattle: Ballard News Tribune, 1988.